I was a machine in the kitchen yesterday. I mentioned that we were going to be heading to my uncle’s cabin this weekend, and since we are following the SCD, we decided it would be easiest for everyone if we just brought our own food for the day. That means I had to get busy. Friday morning started out with a purple smoothie. I decided not to bore you with yet another nearly identical smoothie photo. It looked like this and was extremely tasty. While I slurped my smoothie, I attempted to blog, but our internet was moving at snail speed and I was getting extremely a little impatient. I decided I would hit the gym and run my errands in the meantime while the computer took an hour to upload one photo (exaggerating only slightly). At the gym, I started off with a two-mile run while listening to Pandora. I am a little disappointed in the television show selections at the gym these days. They used to always have one TV that played Bravo/E! shows like The Real Housewives, Keeping Up With the Kardashians, you know, all of those thought-provoking shows. 😉 I would always make sure to plunk myself in front of that TV. Lately, I’ve had to settle with Fox News. Anyway, the run felt pretty good, the entertainment not so much. Then, I hit the weights for some bicep and back work. Once I was done with the weights, I hopped back on the treadmill to finish off one more mile. I was sweatin’ big time by the end of this workout! After the gym, I had to make a few stops to pick up some last food items for the weekend. Back at home, I attempted blogging again. This time around the internet was working much more efficiently, thanks to the hubs. I ate a completely random lunch before getting busy on food prep. If I recall, I ate cooked carrots, pulled chicken, half of a banana, a couple bites of peanut butter. Then it was food prep time. 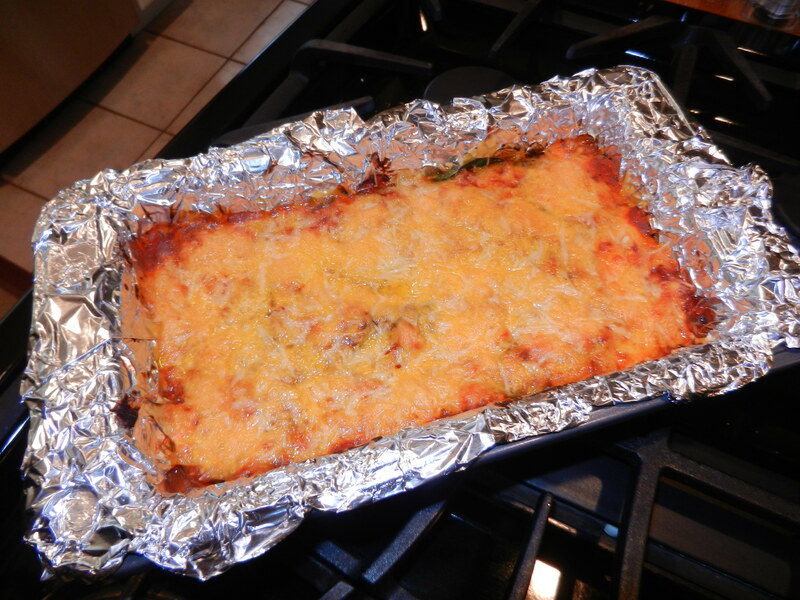 I started by making our dinner meal which was turkey and vegetable lasagna. I used zucchini as the noodles. To prepare the zucchini for the lasagna, I cut the zucchini on a diagonal to give long 1/4 inch thick or less strips. I threw them into a strainer, sprinkled them with salt, and let them sit in the sink for about 20 minutes to help remove excess liquid. After 20 minutes, I blotted each strip with a paper towel then got to layering my lasagna. I didn’t measure exact proportions but I can give you some idea of what I did. I baked this in a bread loaf pan since I was only making the lasagna for Dana and myself. I baked it at 357° for about 55-60 minutes. I finished by turning the oven to low broil to lightly crisp up the top. I placed it into the fridge to let it cool. Once it was cooled I cut out to large pieces and packed them up for the weekend. 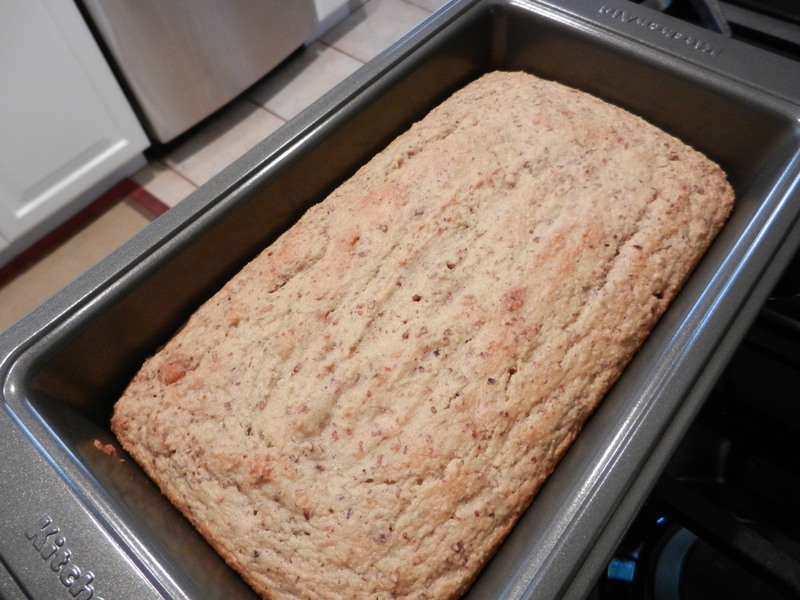 Then I got to making a loaf of almond bread but am using a different recipe now than the one I posted here. The new recipe comes from livinglavidamama and I like it better than the other one because it doesn’t have butter. The taste is nearly identical to the other recipe. While the bread was baking, I cut up a perfectly ripe cantaloupe. Cantaloupe isn’t usually my first choice of melon, I prefer watermelon and honeydew over it, but being the loving wife that I am and knowing the hubby likes it, I went with the cantaloupe this time. I munched on a few pieces while I cut it up and enjoyed it. It’s not that I don’t like it, I just don’t prefer it. It will be a perfect snack for us today. Okay, so lasagna done, bread done, cantaloupe done (I learned how to spell cantaloupe today btw, yet another perk of blogging), next on to lunch. In the morning I started up two chicken breast in the crock pot. At around 2:00, I removed them and cut about 1 1/4 of the two chicken breasts into chicken salad size bites. I added one peeled and chopped apple spritzed with lemon juice, mustard, celery seed, and pepper and mixed it all together. I then prepped a handful of lettuce cups. For lunch: chicken salad lettuce cups. Easy! Lunch, done. So what was left? 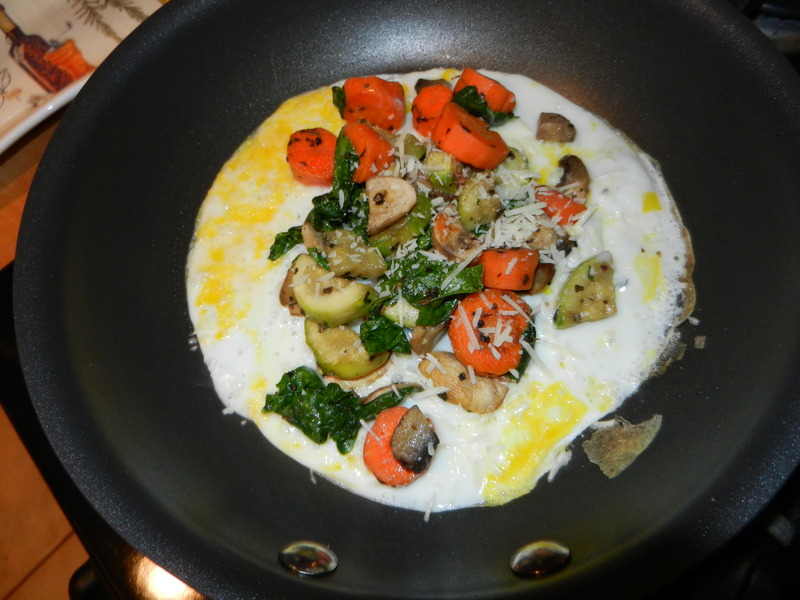 A veggie with dinner perhaps and breakfast. 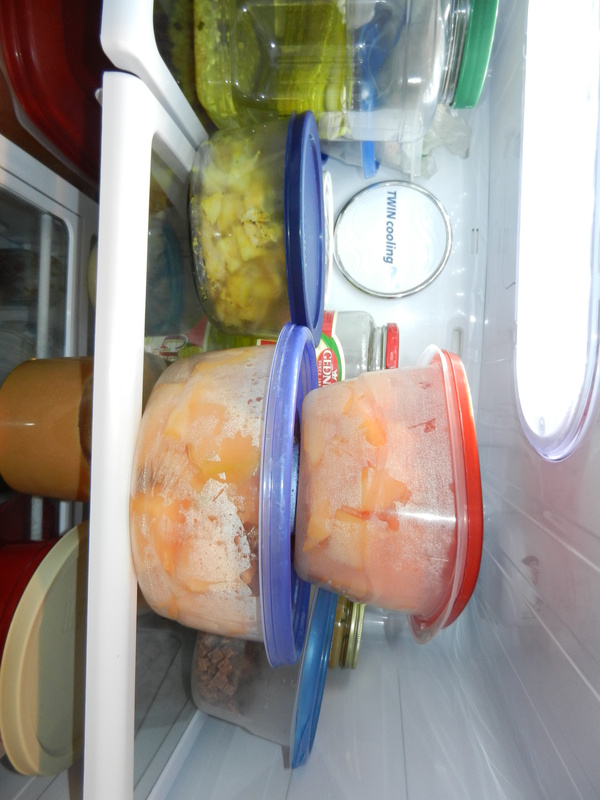 After I cleaned out the crock pot, I thought I would do a little experiment. We have a bag of sugar snap peas that had been in the fridge for quite some time. They weren’t bad yet, but since I’m not able to eat them raw at this point, I wanted to try to use them up before they went bad. I wanted to try to “steam” them in the crock pot. I added the bag of snap peas to the pot, added a cup or two of water, a squeeze of honey, covered them, and set them on low. I let them go low and slow for 2-3 hours. The result was a sort of smoky snap pea. They definitely taste different, but I kind of like them and so does Dana. I added a little salt, packaged them up, and voila. Last prep was breakfast. I made us both banana egg pancakes like the one I had on Thursday. This time I added cinnamon, a touch of nutmeg and allspice to the batter before pouring it on to the sauté pan. Once they were cooked, I packed them up and also packed about 2 tablespoons of peanut butter (1 Tbsp each) for us to add to the top of our cakes. 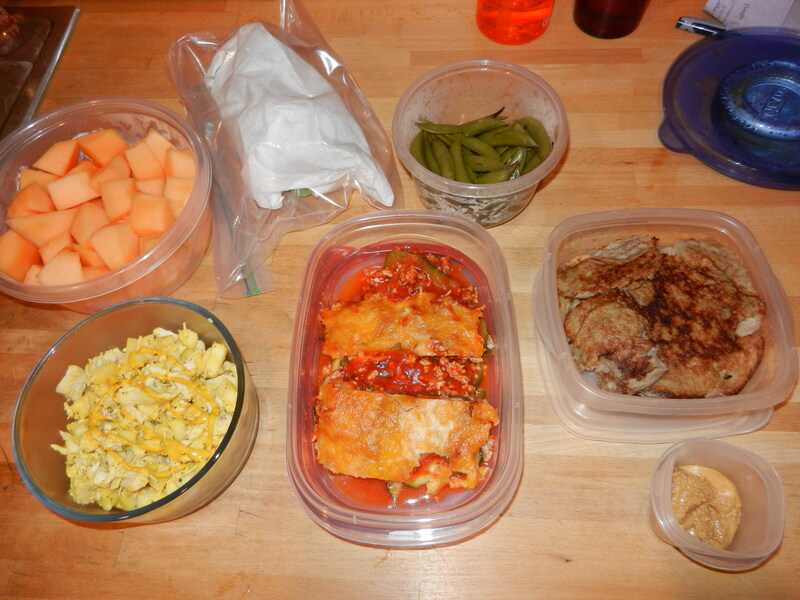 Are you ready for the entire day’s worth of meals in one photo?! Get ready….. 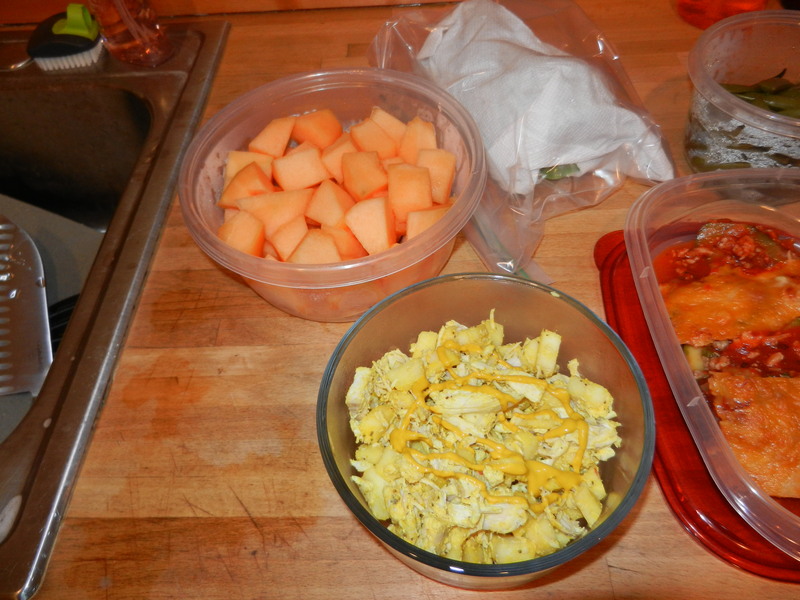 Lunch: Chicken Salad Lettuce Wraps with Cantaloupe. 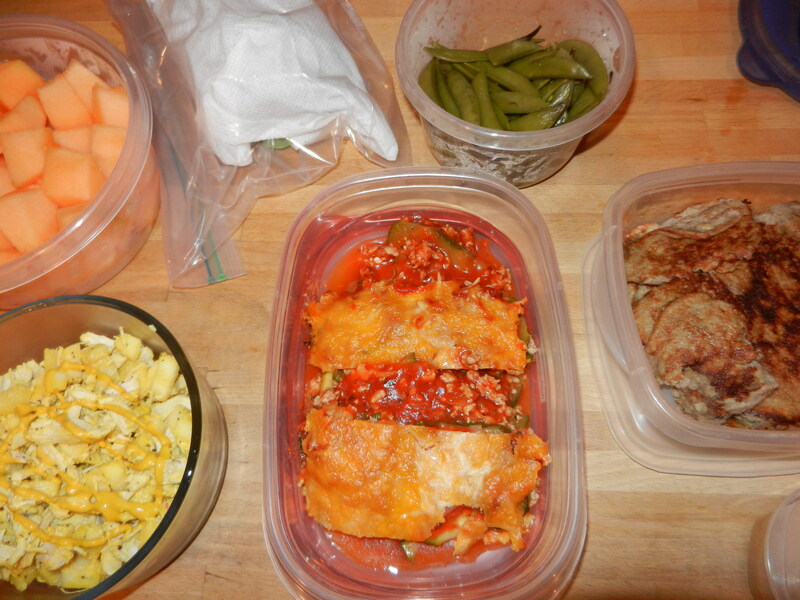 Dinner: Turkey and Vegetable Lasagna and Slow-Cooked Sugar Snap Peas. 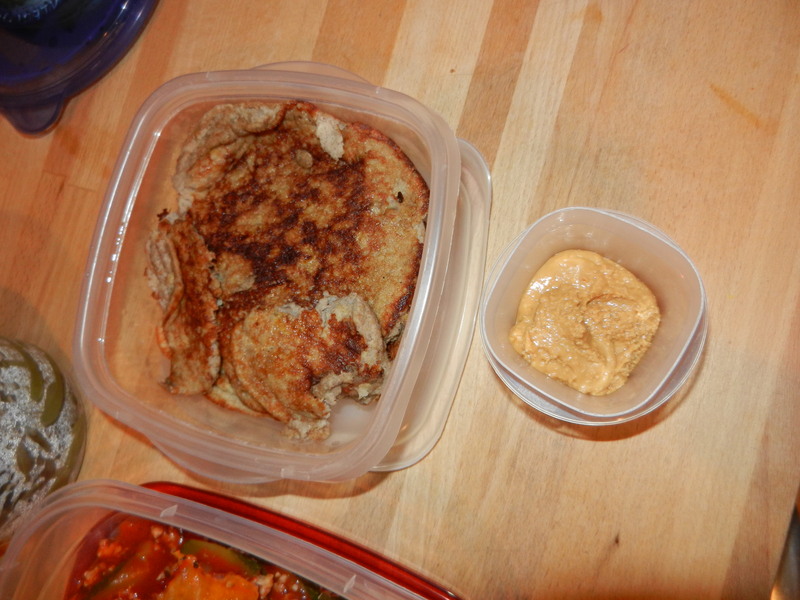 Breakfast: Banana Pancakes with Peanut Butter. She’s a maniac, maniac…in the kitchen! I am pretty proud of my work. That is how you do camping SCD style. Oh what was that? I still need to make dinner? Darn it! 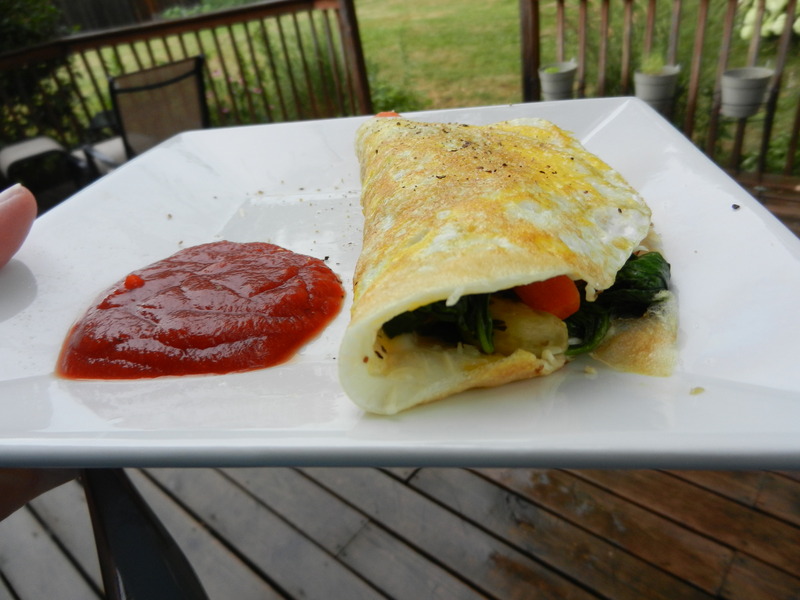 I decided to go real easy and made myself an omelete with one egg and one egg white, and topped it with leftover veggies from the other night, a sprinkle or parmesan cheese, and served it with a big dollop of homemade ketchup. MMmm ketchup! It came together in less than 5 minutes which was just what I needed. I spent the rest of the night relaxing, packing, and painting my toe nails. Today is going to be a GREAT day. I am super duper excited. Can’t wait to fill you all in. Have an amazing day friends! 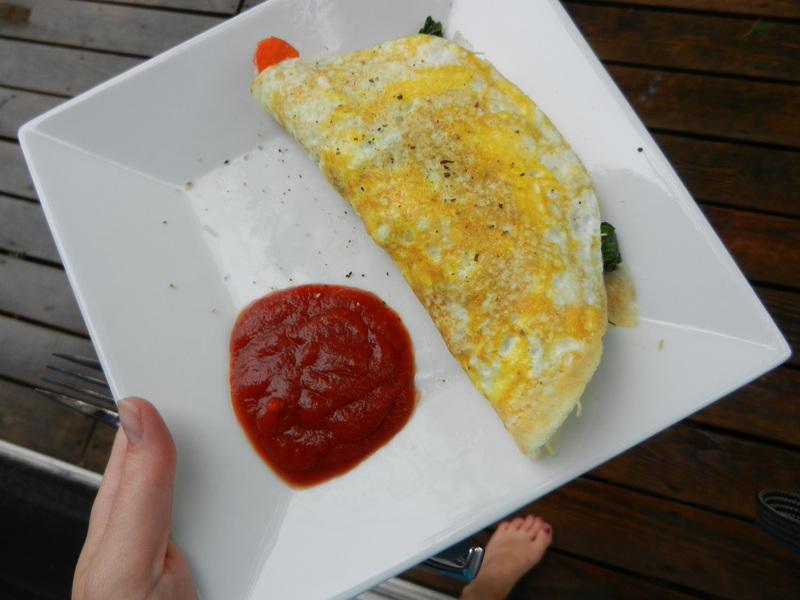 This entry was posted in Breakfast, Dinners, Lunch, Workouts and tagged Bananas, crockpot, Food Trials, peanut butter, Running, SCD, Veggies by Melanie. Bookmark the permalink.